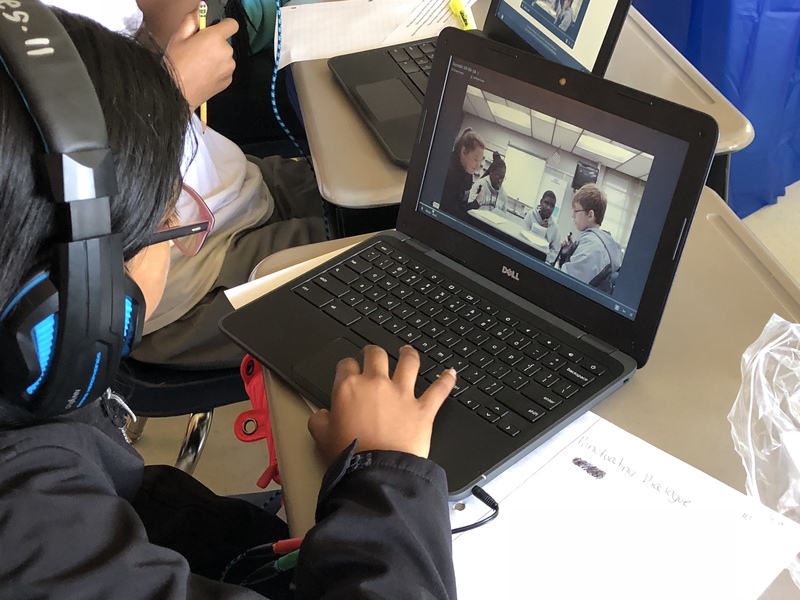 One #PocomokeScholar is shown reviewing a peers’ Socratic Seminar video on Swivl in order to practice writing dialogue between multiple people. Using the Rules of Dialogue, each student was able to practice writing dialogue of the the four peers in the video as well as the teacher. Teaching an old dog a new trick was the mantra for today’s lesson. I have taught writing dialogue numerous times before, but sometimes it did not always workout the way I wanted it to. Some kids got it, some were getting better, and some didn’t care what I was teaching. Today, we took a different approach. Instead of utilizing old tricks, we took a new route to teaching dialogue writing. 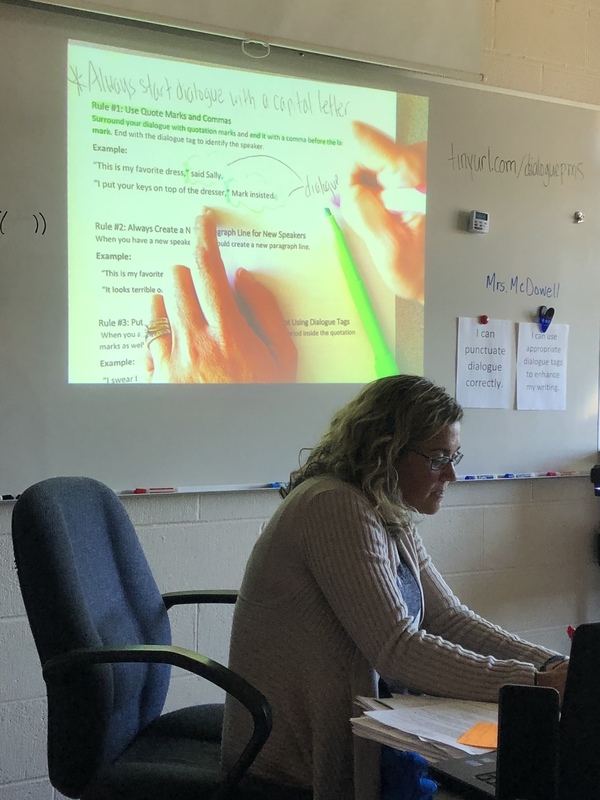 The opening video started with something simple as “What do you mean I have to properly punctuate dialogue?” This resource was used for direct instruction on the do’s and dont’s of dialogue. We stopped throughout the video prompting questions showing the different ways to use dialogue — quotation marks and commas, periods inside quotation marks, punctuating dialogue in reverse, etc. Students recorded the different rules in their composition notebook. Shown is the teacher modeling the Rules of Dialogue pulled from the instructional video. As we were bringing our direct instruction to an end, there was one last piece to model. The actual writing of dialogue. Sometimes students make little skits and have to write it out. I have told students to imagine they are going through the drive thru at a fast food chain before, but the results had not given me what I wanted — until today. Earlier in the week, our class did a Socratic Seminar on the ending of our novel, Wait Till Helen Comes, and it was recorded using Swivl (shown below). The Socratic was one of our earlier attempts, but I never thought how excited students would be watching their peers. Students were glued to the screen, paying close attention to the their peers. We modeled the first 30 seconds actually writing out the dialogue under the document camera and then turned our students loose to practice the same. We were flexible on where in the video they used to practice, but each of them were very engaged in the process. Stopping, rewinding, and playing it back to record the dialogue in their notebook. It seemed simple, but they were excellent today and engaged. I often heard can I be recorded next and be used as the example — referencing the Socratic Seminar. We focused on the dialogue, next we are going to do some more recording, or maybe even a children’s video, to have students record the dialogue as well as the setting using descriptive language. I cannot wait to teach this lesson again. ___ I used quotation marks around my dialogue. ___ I used commas to separate my dialogue tags. ___ I used various dialogue tags to enhance my writing. ___ I placed them either before or after my dialogue to enhance my writing. ___ I placed punctuation inside of the quotation marks. ___ I started a new paragraph every time a new speaker talks. This entry was posted in Instruction, Secondary Education, Technology and tagged #pocomokescholars, Dialogue Writing, ELA, Middle School, Pocomoke Middle School, Socratic Seminar, Student Discussion, Swivl, Worcester County Public Schools. Bookmark the permalink.